Remington 870 Youth 20ga back in 2007. I first took a shotgun class around 2000 with Greg Sullivan’s Defensive Edge in Minnesota. I was amazed at how much I was able to learn in a day. I’ve not done any shotgun training since. Time to remedy that deplorable condition. 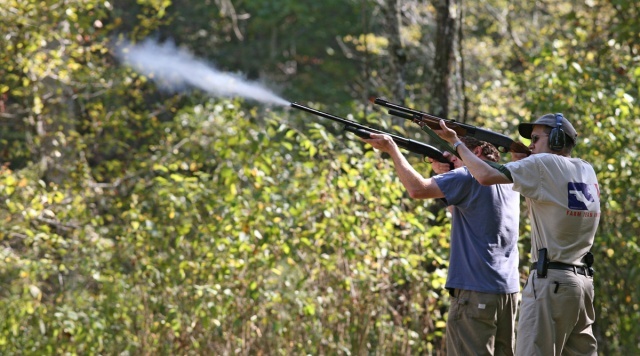 This September, I am heading to South Carolina to learn more about shotguns. The specific course was recommended by Russel Phagan or KE Arms, a very impressive shotgunner. Suarez International has a controversial reputation in the US, while East European gunnies generally respect him for being non-PC. I’d like to see for myself how his instructors present the material. I will bring cameras along and try to do photos and learn at the same time. While there, I also plan on a refresher pistol course. I am looking for suggestions. First off, which shotgun to bring? With any of these, I would need some way to carry ammunition, either loose or in magazines. Again, suggestions are welcome. Would adding a Red Ring sight to either 1100 or X3 be worthwhile? This entry was posted in ammunition, pistol, shotgun, training, weapon and tagged 12ga, 20ga. Bookmark the permalink. 8 Responses to Refresher training. I would think the 1100 would be the most reliable choice. Also the easiest to fix if something did go wrong. I would think there will be a few other 1100’s in the class. We just had a class here in Idaho, and my brother-in-law, nephew and I all ran Weatherby PA-459 12GA pumps. Not a single problem over a 3 day class, apart from a little relubrication needed. Hard to beat for $400. I have pump shotguns, including the superb Nighthawk 870 variant, but I can’t deal with the recoil of 12ga in non-autoloading weapon. IIRC, they also have a 20GA variant, although I could be wrong. I’ve taken three defensive shotgun classes with a Rem. 870 12-gauge. Every class was pump-guns only, and all 12-gauge. Mossberg 500s and Rem. 870s, with maybe a Maverick or something low-end. I’d show up with *both* the 20-gauge 1100 *and* the Winchester youth pump-gun 20-gauge… You never know if you might need a “back up” that is user friendly to you if something goes awry with the first gun [my back up was and is a Smith & Wesson/Howa Japan 3000, which I’ve never had to call on at classes.] You are right to go with the 20-gauge. If I had to “do it over again” that is what I’d opt for, frankly. Ah, I see that both the tube-mag guns are self-loaders… I’d still advocate taking both… You’re just driving over to the carolinas, yes? If airport involved, just the Rem IMHO. I’ve taken Suarez courses and been very impressed with the quality of instruction. I think you’ll have a great time. If those are your only choices then go with the 1100 yoot model with the Winchester a distant second. Unless the VEPR has been completely vetted with many, many rounds downrange prior to the class, and you have lots of reliable magazines (snicker), pass. I’ve seen exactly three of those EAA AR-style guns. One in a class and two in competition. Exactly NONE of them were reliable enough to make it past the first few hours of the event they were participating in.